Urban Hitchhiking is a project that reimagines the traditional concept of hitchhiking: instead of hitching a ride in a vehicle, the hiker hitches a walk in the company of a pedestrian. You can do this simply by placing yourself in the midst of pedestrian traffic and raising your thumb. The purpose is to encounter a random passer-by and share a moment with them. To be mounted in HAM Corner, the Urban Hitchhiking installation will consist of photographs, sound recordings and route maps that were all produced during authentic hitchhiking situations in Helsinki. The installation showcases snapshots of pedestrians in Helsinki and their lives. It also serves as an invitation and a platform for the visitors to try urban hitchhiking themselves. The installation in HAM Corner is constructed of materials that document the hitchhiking period in June 2017. It will be created by the Encounter Arts group consisting of Lauri Jäntti, an anthropologists of religion and urban activist, and Tuuli Malla, performance artist. They are both interested in encounters, both as a phenomenon and as an art form. The purpose of the Urban Hitchhiking project is to bring strangers in the urban space into contact with each other. It makes no demands on the quality or content of the encounter, remaining instead open to all suggestions. The key concepts of the project are randomness, mutual hospitality and the hitchhiker’s willingness to listen. Urban Hitchhiking takes its participants on a journey to meet different others and to explore the urban space and themselves as social realities. The project also challenges conventional ideas of the Finnish national character. 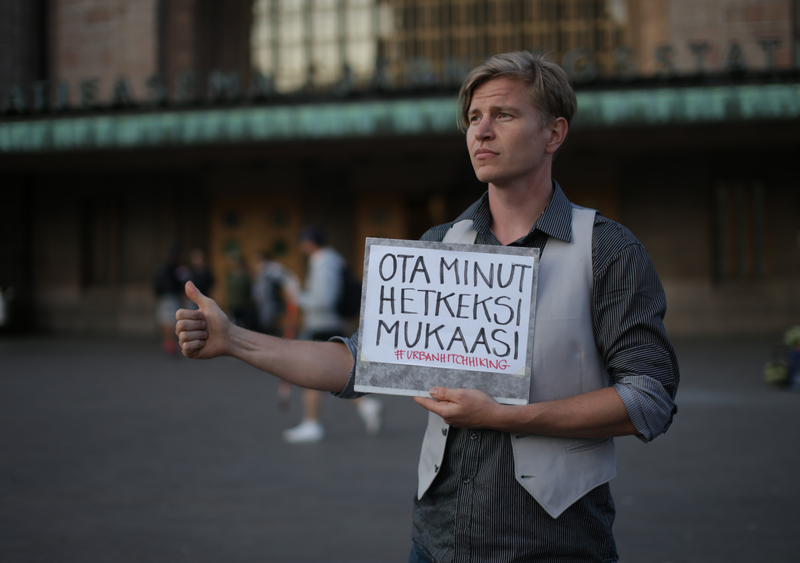 The first Urban Hitchhiking event took place in Helsinki in summer 2016, and since then similar events have been organised in Arkhangelsk, Lappeenranta, Tartu and Prague as well as other places. Visitors who have tried urban hitchhiking for themselves during the exhibition can upload material detailing their experiences to the Urban Hitchhiking Facebook group or to urbanhitchhiking Instagram page. You will find all the necessary instructions here to start hitchhiking. Welcome! At the jam, artists will introduce the exhibition, explain the idea of Urban Hitchhiking and take viewers to the streets to test hitching walks with strangers. The jam will conclude with a gathering at HAM Corner after the hitchhiking sessions. Estimated duration 2 hours.